A choral arrangement of mine, titled Shout for Joy, has been published by Gentry Publications/Fred Bock Music and is distributed by Hal Leonard. Shout for Joy is a modern spiritual, written by my friend Martin Bass. This arrangement is for a cappella SATB choir with a female soloist, and it was first performed in 2002 by the New Jersey All-State Chorus. 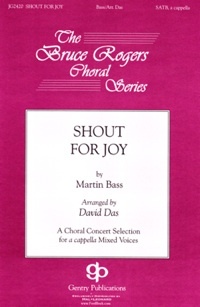 Shout for Joy is available for purchase directly from Hal Leonard. Score excerpts can be viewed here. If you are a choral director and would like a complimentary copy, please use the Contact form to request one, and include your mailing address.